I think of blogging several times throughout my day. I am processing much. Particularly where I’ve traveled since starting this writing journey. I feel I’m at a crossroad, where I’ve healed enough in myself to start sharing more about my coping strategies (yay! ), with less of a need to mentally and emotionally spill and reflect. I’m trusting in this process and the timing, and am excited to see what will arise. I am a bit behind on answering comments. I’ve been continuing to focus on balance in my life, and taking care of my needs and my family’s needs. Comments are always appreciated and read with love. Not answering every comment is growth for me. However, I do intend to go back and answer the more urgent questions. I’ve had to release some guilt, slowly. I was reading over fifty blogs when I first started. My life was blogging for several months. Everything else took a backseat. Now that I’ve regained balance, I haven’t felt the desire to read blogs. I still love the people I connect and connected with through blogging, and hold them in thought many, many times each day. If you are one of the people who blogs and we share(d) a connection, know you still hold a HUGE place in my heart, and that I am at a new place on my path at the moment. Know you are loved and held in high regard. I have a facebook page listed atop this blog; please feel free to friend me. I will continue to write at Everyday Asperger’s, but only when I feel called to do so, and am able to remain balanced in all aspects of my life. I am for the most part truly, truly happy and at peace with who I am and my calling in life. I think this is reflected in my eyes and smile. I know it is reflected in my energy. I am doing better with my health. I have discovered coffee has giving me much more energy (who would have thought–wink-wink) and the ability to lift my mood. I read in a study (laughing to myself, as I seem to like to read studies, and know that studies are contradictory, often funded by money-hounds, and certainly ever-changing and debatable..but tossing all that aside)… I read in a study that 20% of people can cure depression through coffee; I’ve excepted (darn homophone)…I’ve accepted, I either am the 20% or I made this fact a truth in my life! The downfall: Coffee does make me organize and reorganize and reorganize. I think I’ve cleaned and reorganized my bathroom medicine cabinet four times now. And, I tend to ramble and talk more, with caffeine. However, the substance is working wonders for my mind and pain-relief; so I’ll take a little organizing-OCD-bug. I’m back to processing what I look like. hmmmmm? Today the following thoughts are on my mind…well at least for twenty minutes they were. I think I’ve had about forty other subjects pop up since opening this document to write….coffee again. This is how it goes. I dream of my liver, that my liver is damaged, that I need to go to the doctor and get tests. I wake up knowing I’m fine, but feeling the dread of upcoming tests. Someone else’s feelings are with me. Two days later, a relative called and has to go in for liver tests. This is how it goes. I have a thought of giving coats to school. I have a bag of coats in my closet that are too small for my son. All day I think of whom to give the coats to. It’s like a moving picture in my mind. Whom to ask? The thought keeps circling. Hours later, my son comes home from school with a note about families in need of clothing and other items. This is how it goes. I wake up at 4:45 am with thoughts and cannot get back to bed. I look in the mirror and have a bite on my cheek. My mind spins. I keep thinking of the butterfly rash that accompanies the auto-immune condition lupus. I know I do not have lupus, but I can’t stop checking my cheek in the mirror. I can only think of lupus. I can only think to check. Soon, my good friend calls. She was up most the night. Her doctor just called to say she has lupus. This is how it goes. I wake up with dread, with unexplained fear. I am worried. Something is going to happen. That day a friend has a breakdown. Instantly my dread is gone and I am better. This is how it goes. I haven’t been to a particular store in months; no interest, no want. A voice inside says, “Go today. Go today.” I fight the voice. The voice still comes. “Just go. Only for fifteen minutes. Just go.” I drive. I arrive to find the dresser I’ve been visualizing in my mind for the past couple months. 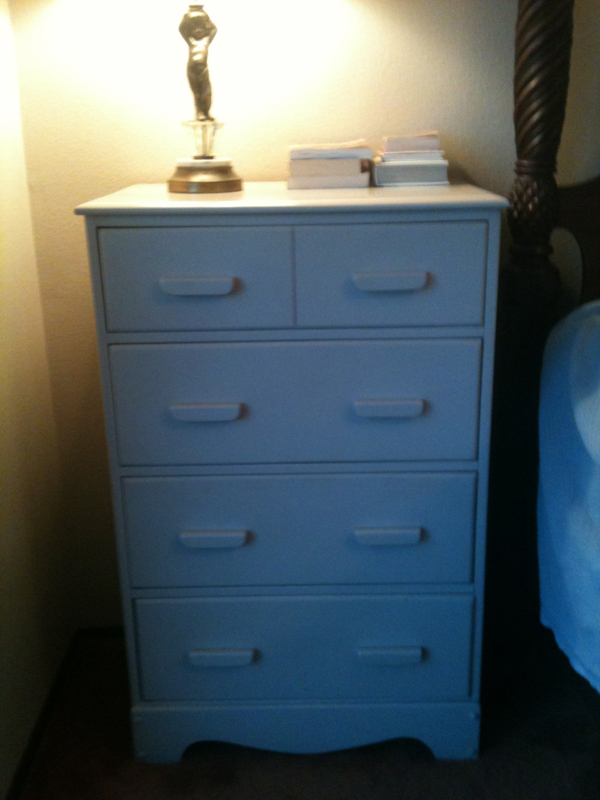 The exact antique dresser I’ve wanted for my room at the Goodwill for only $40. Mint condition. Lovely. The entire transaction from finding the dresser, paying for dresser, and helpers placing dresser in trunk of van takes exactly fifteen minutes. The past few days I’ve been analyzing actresses on television and how their hair affects the way they look. Somewhere in my head, I got stuck with the thought that if I don’t look nice in every photo I take, then I truly look like the ugliest photo. I mean, wouldn’t it be nice to be narcissistic for one day, and believe I always look like the best photo? But NO, my little brain thinks I MUST look like the worse photo. Of course, this is the same brain, who somewhere along the road, gathered the baggage that if I don’t look beautiful with my hair unbrushed, makeup off, and in frumpy, stained clothes, then I am not naturally beautiful. The same mind that played tricks on me and told me that if I wear make up and fix my hair up and take a nice photo that that is a lie, and fake, and not the real me to begin with. So if someone gives me a compliment, while I’m fake, then the compliment is not real either! The same brain that told me all these years that when someone tells me I’m beautiful or pretty that he or she is just saying that because truthfully I’m hideous and they are trying to lift my spirits. That, in truth, the entire world is in a conspiracy to make me think I’m lovely, because in truth when they look at me they feel sorry for me. OH, MY GOSH! Growth, growth, growth. First photo is a few minutes before the other photo. Between the photos, I simply put on a sweater, eye makeup, and lipstick. Hair behind ears, head tilted different direction. I really am fascinated with how lighting, clothes, hairstyle, and makeup affects photos. Before photo. No make up. Now, of these three photos which one is the real me? you are too funny. Remember also, that we are in constant motion, as seen by others, not a freeze frame static snap shot. Images of others flip by constant motion, so the reality must be true for us too. You should take the worst (planned) photos of yourself ever possible, on purpose,..then all of them from then on will be great. I do this with my sister. We are like a moving river indeed, never ever the same for one second. Your river seems to be really pretty.yep. This is wonderful my lovely friend, you make me smile and giggle. We are so very much alike. Listening to your thought process is like listening to myself. We have such busy, busy brains don’t we?! Busy bees, we be. Thanks for getting me and loving me. xoxo special one. Ah, Sam, how far you have come just in the time I have known you! You do seem happy and, by the way, you take good pictures! Keep on smiling and sharing the love you have inside. I consider myself one of those who connected with you. I am not upset that you blog less; instead, I am happy you are growing as that is the point.